MISSION, KS--(Marketwire - Nov 1, 2012) - (Family Features) Starting off the day with a latte isn't just a way to get a quick morning pick-me-up -- it's a way to get a quick boost of nutrients. A latte can deliver a full serving of milk's nine essential nutrients, including calcium, vitamin D and potassium. It also has eight grams of high-quality protein in eight ounces -- even more than an egg. Being your own barista lets you customize your morning latte -- and save money. Here are some tips and latte recipes to help you get the day off to a great start. If using a steam wand, experiment with the depth of the wand and how close it is to the edge of the milk container. Where you place the wand affects the milk's texture. It takes practice to get an even texture, so be patient and enjoy your experiments. If you don't have a steam wand or milk frother, you can steam milk on the stove top. Put cold milk in a sauce pan -- making sure there's room for the foam. Whisk the milk. Whisk faster as the milk heats. Don't let the milk boil. Once you have enough foam, remove the pan from heat. You can find flavored syrups at many grocery stores. Use a shot glass measuring cup marked with ounces to help you get just the right amount of syrup. You can also find great flavors in your spice cabinet. Try cinnamon, nutmeg, and even pumpkin pie spice in your latte. For a really decadent finish that won't add fat, top your latte with a little nonfat whipped topping and a sprinkle of cocoa powder. 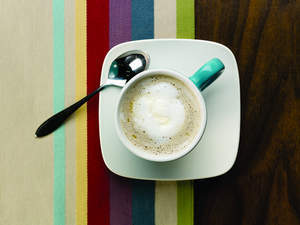 You can find more tips and recipes for lattes and other coffee drinks at www.MilkMustache.com. Combine chilled espresso or coffee, milk and syrups in a tall glass filled with ice and stir well. Steam milk and syrup together. Pour heated, flavored milk into a mug and add brewed espresso or coffee. Spoon a thin layer of foamed milk over beverage. Steam together milk and syrup. Pour heated, flavored milk into a mug and add brewed espresso or coffee. Spoon a thin layer of foamed milk over beverage. Drizzle with caramel if desired. Nutrition: 80 calories; 0 g fat; 0 g saturated fat; 5 mg cholesterol; 8 g protein; 13 g carbohydrates; 0 g fiber; 130 mg sodium; 300 mg calcium (30% of daily value). Steam milk and syrup together. Pour heated, flavored milk into a mug and add brewed espresso or coffee. Spoon a thin layer of foamed milk over beverage. Sprinkle with cocoa if desired. Nutrition: 140 calories; 1 g fat; 0 g saturated fat; 5 mg cholesterol; 9 g protein; 27 g carbohydrates; 0 g fiber; 160 mg sodium; 300 mg calcium (30% of daily value). About this company Got Milk?